Move "Initial conditions" point on the right hand screen to change the initial conditions. On the left are the two solution curves for x and y when the DEs are solved together. On the right is the phase plane diagram. 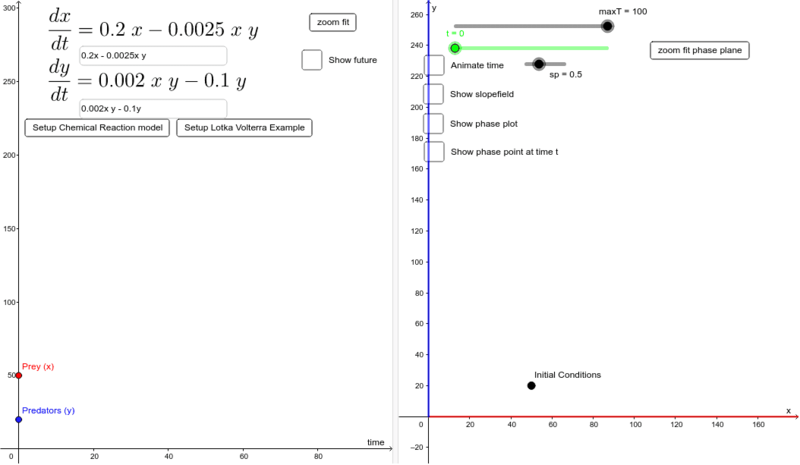 Two examples are available: 1. the Lotka Volterra predator-prey model (loaded on startup). 2. A model of two reagents in a chemical reaction (solving this is within the scope of A-level Further Maths) You can also edit the two functions to create your own. (best to do this after ticking the Chemical Reaction model, to remove references to predators and prey etc) (the zoom fit buttons on each side should give a way to zoom the views appropriately, but may malfunction if an usual function is created!) Use the checkboxes to display/hide various info. In particular click "Animate Time" to show an animated solution.